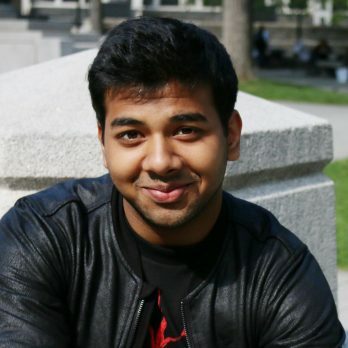 For Saif Choudhury, laughter has been the best medicine—and also part of his academic pursuit. Yes, he is an English Honors major with a concentration in Creative Writing at City College, and he is studying journalism, but that only tells part of the story of this Stuyvesant High School graduate. Saif is also pursuing a career as a standup comedian. His father suffered a debilitating stroke during open heart surgery when Saif was 8-years old, leaving his dad unable to perform the simplest tasks, such as tying his shoes. It rocked Saif’s young world. Cue Saif’s successful admission to the tuition-free Macaulay Honors College, and college was no longer a financial burden. Outside the classroom at Macaulay, Saif has spent his time working for of the Zahn Center to implement Gol, a social-impact startup organization that aims to bring clean water to impoverished and underdeveloped communities. Saif also has studied abroad in Athens. But he also had to find humor in the world, which led him to studying as an Upright Citizens Brigade Training Diversity Scholar to hone his comedic skills, and he became an Improv Your Life Scholarship recipient from the People’s Improv Theater. Saif has performed standup comedy several times at the Gotham Comedy Club. Although Saif’s parents arrived in the U.S. with college degrees from their native Bangladesh, neither was able to pursue their professional careers. His mom’s plans to be a lawyer ended before her arrival here. That’s the family’s dry humor that has maintained them as a unit and for which Saif has been able to move forward positively. He also credits his college, classmates and surroundings in lifting his spirits.